The game of Poker is one that has been loved by players throughout multiple generations. The simplicity of the game makes it quite easy to learn. Although it is simple to play, you would need some bit of experience in order to win big. This means that poker is good for beginners and would serve the whims of experts. The popularity of this game has ensured that it has multiple variants. One of the popular variants of Poker is Jacks or Better Video Poker. A lot of developers have developed games of this title. NetEnt has been in the online slot software development industry since 1996. This makes this developer one of the oldest in the industry. The innovation at NetEnt is visible in the fact that this developer was the first to create an online casino platform making use of java programming language. However, NetEnt has since migrated to the use of HTML 5 and Flash technology. NetEnt’s games are used by more than 300 licensed operators all over the world. NetEnt can proudly boast giving out millions of dollars in jackpot to casino players over the years. The quality available at NetEnt would be greatly displayed in the quality it brings to the development of Jacks or Better Video Poker. Wins in this game are gotten when you get a pair of jacks or a higher value symbol in your hand. This informs the name ‘Jacks or Better Video Poker’. The graphics are similar to a standard video slot design. The five cards used by the player are displayed at the bottom of the screen. The paytable is located above the cards while the there is a chart to the left-hand side which shows the amount of money won during gameplay. Players have the choice of making use of about 1, 2, 10, or 25 hands when you exercise this option; it appears in place of the paytable located above the card. 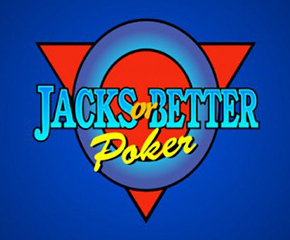 The objective of Jacks or Better Video Poker, as previously stated, is to get a pair of jacks or higher value cards in your hand. To start the gameplay, click on the green button to have your cards dealt to you. You can choose to hold the card that you fancy. Clicking the green button again would give you a replacement for your cards. If you have a card with a possible winning combination, it would be held automatically. While playing, you might notice a ‘gamble’ button. Click on this button to get a chance to double your winnings. You can do this for a total of five times. Getting a wrong guess at your gamble would result in you losing your wins. 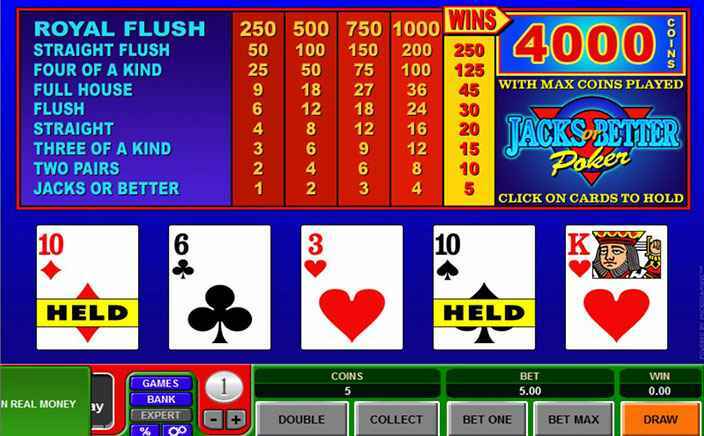 There are no extra features in this game compared to other Jacks or Better Video Poker games. This greatly affects the level of excitement that can be gotten during gameplay.